Here at ChiIL Live Shows, we live for rock/punk/metal and love film, so it's no wonder we've been covering CIMMfest from the start! Now entering year 9, we'll be back again, shooting stills, and reviewing shows. Got your tickets? You can do a full on festival pass good for everything, like we have, or catch individual showings, and a few hybrid passes in between. Thankfully, everyone's taste in tunes is different, and CIMMfest has something for everyone, happening simultaneously, all over town. Click HERE to check out the full lineup. Then check back with ChiILLiveShows.com early and often, on line and social media, for our top picks, recaps, and more. The Chicago International Movies & Music Festival (CIMMfest) announces its full movie and music lineup for the ninth edition, running November 9-12, 2017, centered at the Davis Theater and running across multiple venues throughout Chicago, including Martyrs’, Old Town School of Folk, GMan Tavern, Subterranean and others. Individual tickets for most events start at $10; 4-day festival passes start at $79. Festival passes and a la carte tickets are available at CIMMfest.org. This year’s multimedia festival features more than 40 events including two world premieres, 4 U.S. premieres, 5 Chicago premieres and 8 Midwest premieres; musical acts representing a wide variety of genres; and CIMMcon, CIMMfest’s dynamic professional and creative industry conference. On Thursday Nov. 9, CIMMfest and CHIRP Radio present opening night with the Midwest Premiere of Living on Soul, a heartfelt hybrid documentary/concert film which wraps the story of soul-music powerhouse Daptone Records around electric Apollo Theater performances by label stalwarts like Antibalas, Budos Band, and the late Charles Bradley and Sharon Jones. 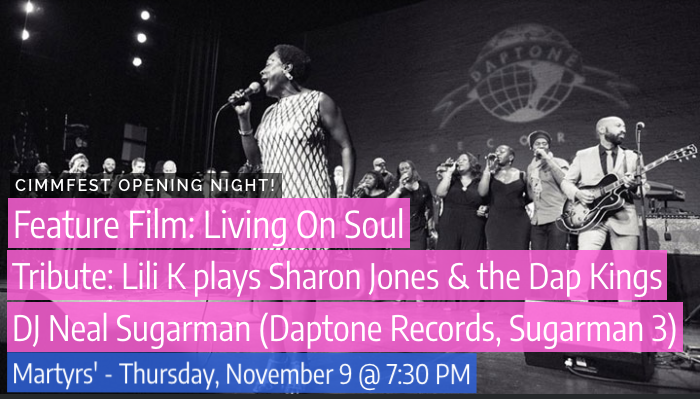 The screening at Martyrs' will be followed by the official opening night afterparty, featuring a live performance by Chicago soul diva Lili K, paying tribute to Sharon Jones, and DJing by Daptone co-founder Neal Sugarman. Actress and podcaster Aisha Tyler makes her feature directorial debut with Axis, also screening on opening night at 7 p.m. at the Davis Theater. 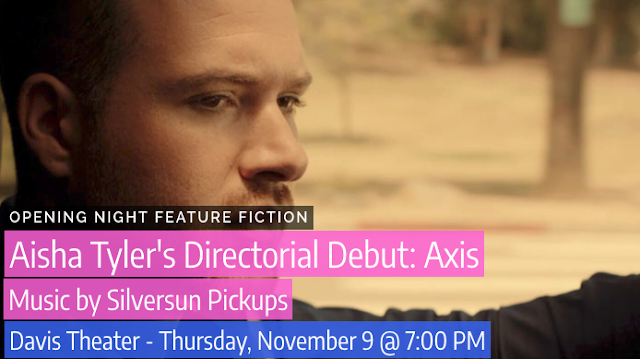 With an original score by Silversun Pickups, Axis stars Irish actor Emmett Hughes as a reformed Hollywood bad boy who finds his life unravelling in a series of phone calls as he drives across LA. 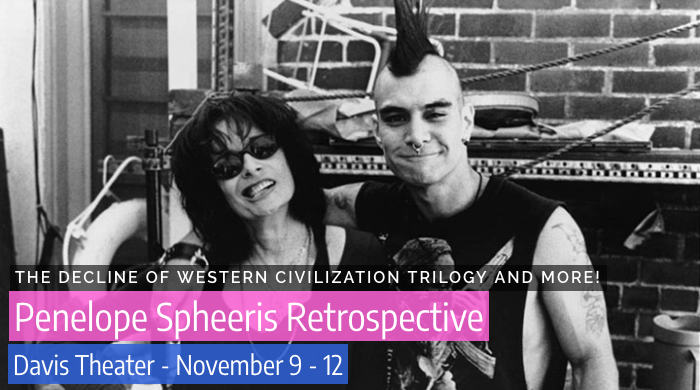 The weekend’s Penelope Spheeris’ retrospective begins with the first two installments of her Decline of the Western Civilization trilogy, playing back to back at 7:15 p.m. & 9:30 p.m., respectively, at the Davis Theater. 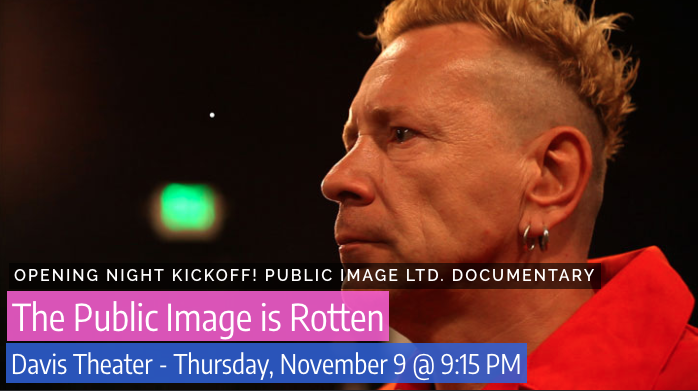 Rounding off opening night is the story of John Lydon’s arguably more influential second band, told largely by Mr. Rotten himself, in the documentary The Public Image Is Rotten. Director Tabbert Fiiller joins PiL drummer-turned-Chicago music maven Martin Atkins for a post-screening conversation, at the Davis Theater. Films with strong Chicago ties include 2350 Last Call: The Neo Story, The Chicago Mixtape, It Never Ends, Karl Wirsum, Red Line Lounge, Bill's Records, Do U Want It?, Electric Heart, Piano Players Rarely Ever Play Together, Psychogenic Fugue, Queercore: How to Punk a Revolution and Horn From the Heart: The Paul Butterfield Story, the first comprehensive screen portrait of one of Chicago blues' greatest native sons and CIMMfest No. 9’s closing film (Davis Theater, Sunday, November 12, at 7:30 p.m.). 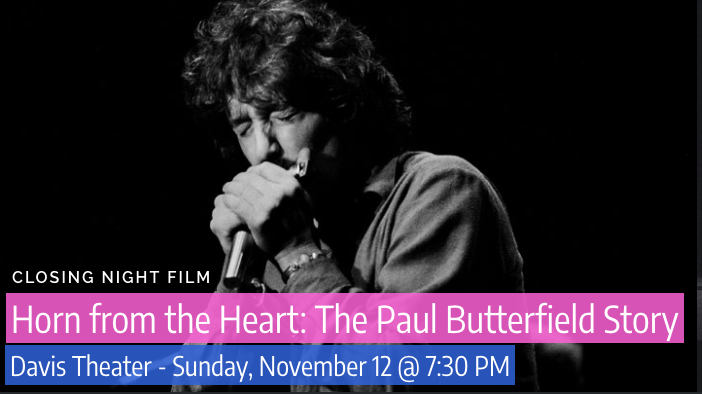 Join director John Anderson (Born in Chicago, Sam Lay in Bluesland) and producer Sandra Warren for a post-film Q&A. Closeup: Tank and the Bangas, a short doc about one of New Orleans’s most acclaimed new bands, will be screened in tandem with NOLA?, in which Big Easy artists, writers, and scene mainstays talk about the city’s musical past and post-Katrina present. A Q&A with Closeup director Charlie Steiner will follow the films, which screen at 2:40 p.m. on Sunday, November 12. See Opening Night listing above. An intimate portrait of a bold musical mind at work as the Sonic Youth guitar genius collaborates with novelist Jonathan Lethem, fellow axe innovator Nels Cline, and other creative fellow travelers to produce his new album Electric Trim. Q&A with filmmaker Fred Riedel to follow screening at the Davis Theater. 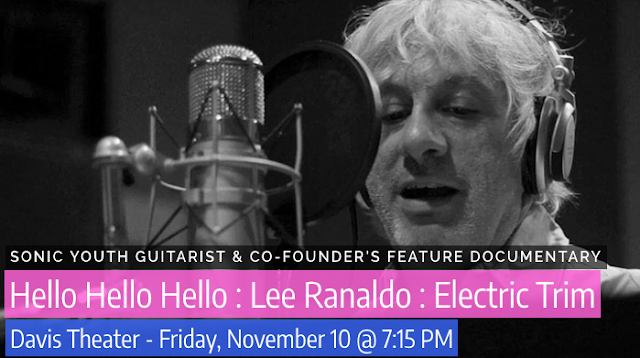 Prior to the screening, Lee Ranaldo will perform at Subterranean on November 5. Six Strings of Separation documents how luthier Tom Lieber, who began his career apprenticing with Jerry Garcia’s guitar maker, commemorated the 50th anniversary of the Grateful Dead with a custom line of axes modeled on Jerry’s classic “Wolf” and “Tiger” guitars. Grateful Dead tribute band Dark Star Originals, featuring John Kadlecik, Mike Maraat, Kevin Rosen, Ahmer Nizam, and special guest John Kattke, will perform after the screening at Martyrs. Folk troubadour Tom Rush takes residence at Chicago’s Old Town School of Folk on CIMMfest’s closing day and evening with a screening of the documentary Tom Rush: No Regrets at 2 p.m, featuring a Q&A with the iconic singer, and an intimate live performance at 7 p.m., both in Old Town’s Szold Hall. A recollection of the iconic Lincoln Park club that was a haven for goths, punks, and adventurous misfits for more than three decades before closing in 2015. 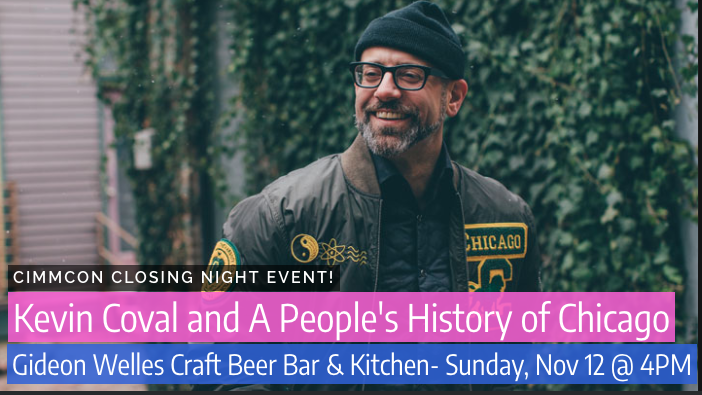 There will be a Q&A with filmmaker Eric Richter, and longtime Neo DJs Suzanne Shelton, Jeff Moyer, and Scary Lady Sarah will spin after the screening at Gman Tavern on closing night. Mexican guitarist Camilo Nu goes adventuring in search of his musical roots, crossing the Atlantic to find the Andalusian, Arab, and African antecedents of son jarocho, the traditional folk style of his native Veracruz. Camilo Nu will give a short acoustic performance after the 7 p.m. screening at the Davis Theater. Americana takes center stage at the Davis Theater with these back-to-back narrative films, beginning at 3:10 p.m.. The Last Hot Lick features Jaime Leopold, the charter bassist for psychedelic jug band Dan Hicks and His Hot Licks, playing a fictionalized version of himself in this sweet, sad drama about an aging troubadour on a never-ending tour. Post-screening Q&A with Mahalia Cohen, producer Deborah Cohen, Jaime Leopold, and Jennifer Smieja, followed by a live performance by Leopold and Smieja at the Davis Theater. Cowboy Drifter is the tale of a boozing, brawling rogue who gets more than he bargained for when he heads west in search of his old man, a failed country singer who abandoned his family decades ago. The killer soundtrack features the Revivalists, the White Buffalo, John Hiatt, Taj Mahal, and co-star Aubrey Peeples, formerly Layla Grant of TV’s Nashville. Post-screening Q&A with Peeples, writer/star Chuck Carrington, director Michael Lange, and producer/music supervisor Jonathan McHugh. Later that evening, Jaime Leopold and his band, the Short Stories, will perform at the Grafton Pub, followed by an intimate set by Aubrey Peeples. A full list of CIMMfest’s movie and music events, in addition to the CIMMcon roster, can be found at CIMMfest.org. 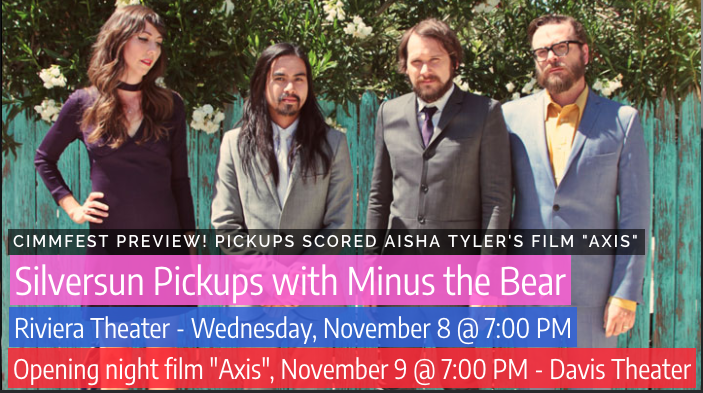 With an original score by Silversun Pickups, Criminal Minds and Archer co-star Aisha Tyler's directorial debut is a taut drama about a Hollywood bad boy who finds his life unravelling in a series of phone calls as he drives across LA. Thursday, November 9, 7:15 p.m.
A preeminent artifact of American punk and one of the most influential music docs ever made, Spheeris's first feature unflinchingly captures the scene that emerged from Hollywood’s subterranean art culture of the late 1970s and the furor it spawned. Featuring concert footage and memorable interviews with punk pioneers Black Flag, X, the Circle Jerks, Catholic Discipline, Fear, and the sweet, sad, brilliant wreck that was Darby Crash and the Germs. Johnny Starke is a DJ on a mission: to dig in every dusty thrift-shop record crate he can find until he unearths the great lost soul dance single. Thursday, November 9, 9:30 p.m.
Spheeris's follow-up to her stunning documentary on Los Angeles punk depicts LA's metal scene from 1986 to 1988, when hair bands ruled the Sunset Strip. While tracking the fortunes of would-be glam gods like Odin, Seduce, and London, Decline II features interviews with actual hard-rock gods like Ozzy Osbourne, Alice Cooper, Steven Tyler, Lemmy, and Paul Stanley and notoriously captures the era's aura of excess, misogyny, and sleaze. Thursday, November 9, 9:15 p.m.
notorious first group. Post screening Q&A with director Tabbert Fiiller & former PiL drummer Martin Atkins. In December 2014, Daptone Records celebrated its 20th anniversary with a three-night revue at the Apollo Theater, the first multi-night residency at the historic Harlem hall since James Brown did it in the ’70s. Anchored by galvanizing performances by Antibalas, Budos Band, Como Mamas, and the dearly departed Charles Bradley and Sharon Jones, this concert film/documentary blend tells the Daptone story in words and music and captures the family dynamic driving this funk/soul powerhouse. Lili K plays Sharon Jones / Neal Sugarman DJ Set to follow. Friday, November 10, 6 p.m. 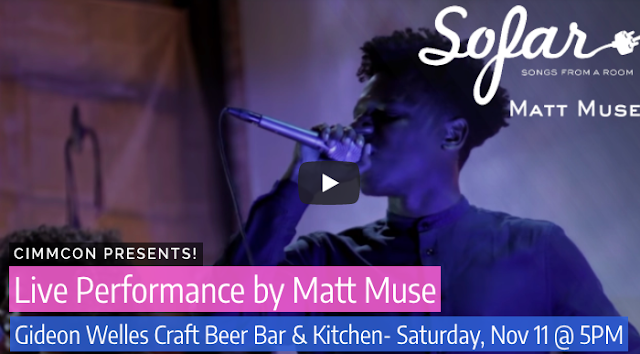 Opening CIMMcon Friday evening, this short documentary spotlights the teen poets of Louder Than a Bomb, fusing hip hop performance and social activism in the footsteps of mentors like Rhymefest and Chance the Rapper. Q&A with Kevin Coval and others after the screening. CIMMcon opening reception to follow. Friday, November 10, 6:10 p.m.
Drummer Avreeayl Ra, an acolyte of Sun Ra and an anchor of Chicago's free-jazz scene for decades, takes a tour of the city places that shaped his life and music in this short documentary. Q&A with Thomas Carillon and Avreeayl Ra to follow. Largely unseen for nearly two decades after its brief release, the third installment of Spheeris's Decline trilogy chronicles homeless teenage "gutter punks" living on the streets of Los Angeles and explores her relationship with one such kid, called Eyeball. While retaining the LA music frame of its predecessors, Decline III is as much about a generation deeply alienated from mainstream society, and Spheeris’s own journey toward becoming a foster parent to her once-blighted subjects. Introduction by Penelope Spheeris. Friday, November 10, 9:40 p.m.
Friday, November 10, 7:15 p.m.
An intimate portrait of a bold musical mind at work as the Sonic Youth guitar genius collaborates with novelist Jonathan Lethem, fellow axe innovator Nels Cline, and other creative fellow travelers to produce his new album Electric Trim. Q&A with filmmaker Fred Riedel to follow screening. 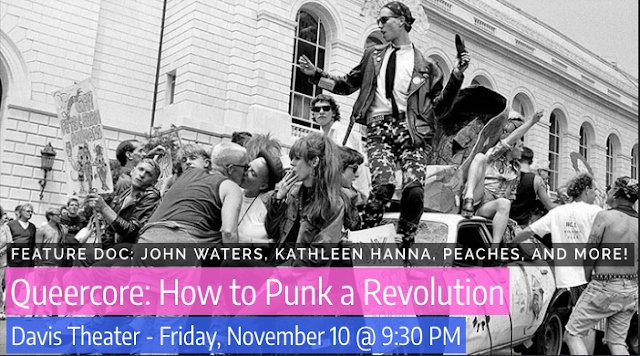 Friday, November 10, 9:30 p.m.
John Waters, Kathleen Hanna, and Peaches features in this kinetic fanzine of a doc tracing how a pair of Toronto underground filmmakers created a musical and cultural movement that opened up punk to radical queers. Q&A to follow with director Yony Leyser. Friday, November 10 at 9 p.m.
Saturday, November 11, 11:30 a.m.
A long-overdue look at journey of young black men who found a way out of poverty through spiritual music in the first half of the 20th century. Tastefully mixing vintage clips, archival images, and interviews with members of the Blind Boys of Alabama, the Soul Stirrers, the Dixie Hummingbirds, and other groups, this is the quintessential history of gospel music’s legendary quartets and their enduring influence on rock, soul, and R&B. Saturday, November 11, 12 p.m.
A deep dive into the rise, fall, and future – yes, we said future – of “music’s worst format” (the filmmakers’ words, not ours): the clunky, crap-sounding, revolutionary cassette, the first technology that made your tunes portable and shareable. Cassette limns the pre-digital joy of mix-making and the way cheap tapes gave early indie rockers and rappers a crucial path to market, but it transcends sprocket nostalgia in its portrait of the now-elderly Dutch engineer who invented the goddamned things. Saturday, November 11, 1:30 p.m.
Keith Crombie was the cranky, contrarian spirit of Newcastle jazz, presiding for decades over the English city’s premier dive — Jazz Café, a home away from home for anyone from Eric Burdon and Wynton Marsalis to generations of young Geordie misfits. This atmospheric portrait recounts his early adventures in the music business (and, just maybe, the mob) and celebrates a life dedicated to keeping the blue note beat alive. Post screening Q&A with director Abi Lewis. A portrait of Chicago drummer Dave Russell, a former Son Seals and Jimmy Johnson sideman who’s fallen on hard times. Now homeless, he keeps the music alive with the Red Line Lounge Band, providing daily entertainment for Chicago commuters. Saturday, November 11, 2 p.m. In a city besieged by shelling and sniper fire, it seemed a fantastical rumor: Iron Maiden's Bruce Dickinson was coming to Sarajevo play. 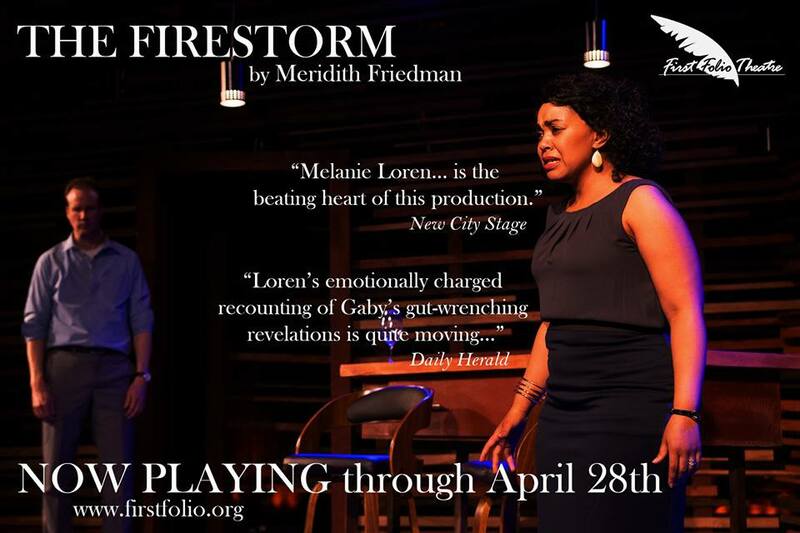 An unlikely and inspiring story of people who risked their lives to perform for people who risked their lives just to live them. Saturday, November 11, 3:10 p.m.
Fifteen years ago, the Icarus Line was rocketing to the top of the LA underground with a hot debut album and a major-label deal. 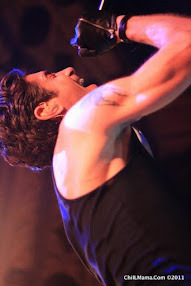 Now frontman Joe Cardamone is 36 and broke, and the record companies won’t touch his new stuff. Plus, he’s getting death threats by text. Cardamone wrote the script and plays a thinly veiled version of himself in this No Wave-style noir about navigating the modern music biz, co-starring Ariel Pink and Keith Morris. Post screening Q&A with director Michael Grodner. Jaime Leopold, the charter bassist for psychedelic jug band Dan Hicks and His Hot Licks, plays a fictionalized version of himself in this sweet, sad drama about an aging troubadour on a never-ending tour. Post-screening Q&A with Mahalia Cohen, producer Deborah Cohen, Jaime Leopold, and Jennifer Smieja, followed by a live performance by Leopold and Smieja. Saturday, November 11, 4:00 p.m. This nooks-and-crannies exploration of Ozzfest played a handful of film fests upon release and his been virtually unseen since. Spheeris captures everything, from the observations of fans, groupies, tour-bus drivers, and pyrotechnicians to Ozzy’s backstage oxygen treatments, Slipknot visiting the Lincoln Memorial in full regalia, and performances by Black Sabbath, Primus, System of a Down, and many more. A rare treat for devotees of metal and backstage tour docs. 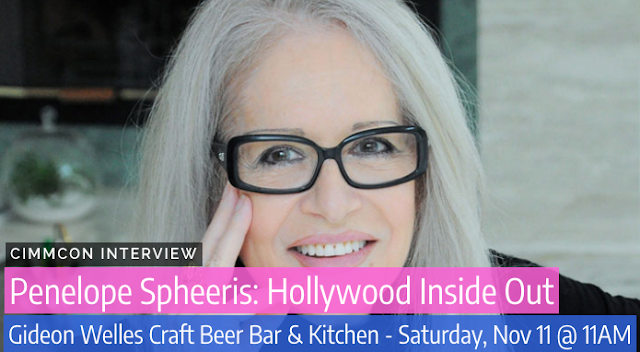 Introduction and post-screening Q&A with Penelope Spheeris. Saturday, November 11, 5:30 p.m.
A soulful Americana soundtrack featuring the Revivalists, the White Buffalo, and Keb’ Mo’ accents this brooding, dark-humored drama about an aging rogue looking to shake the legacy of his dissolute country-singer dad. Q&A to follow with writer/star Chuck Carrington, co-star Aubrey Peeples, director Michael Lange and producer/music supervisor Jonathan McHugh. Saturday, November 11, 7:50 p.m.
A personal, visually striking chronicle of the soft-spoken, sartorially splendid singer's rise from Bakersfield to Brooklyn to late-blooming global fame as one of the most distinctive voices in jazz. Saturday, November 11, 8 p.m.
Acclaimed luthier Tom Lieber, who began his career apprenticing with Jerry Garcia’s guitar maker, commemorates the 50th anniversary of the Grateful Dead with a custom line of axes modeled on Jerry’s classic “Wolf” and “Tiger” guitars. Performance by Dead tribute band Dark Star Originals to follow. Saturday, November 11, 10 p.m.
Martin Ravin lives alone in a secluded lake house, mourning his murdered wife and consoling himself with Irish airs. One night he spies a trysting young couple commandeering his canoe for a moonlight ride; when only the boy returns, Martin takes matters into his own hands. Is he seeking justice? Vengeance? A way to keep his past at bay? 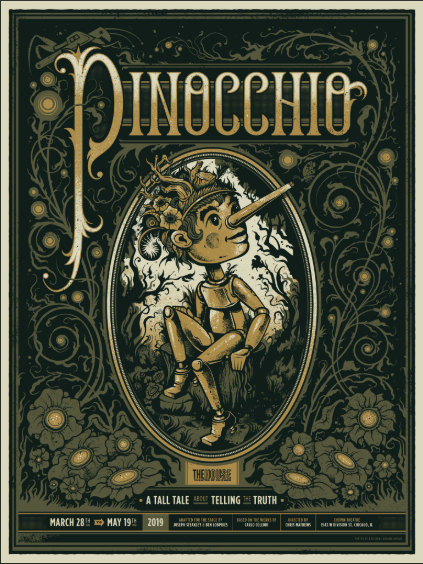 A brisk, surprising thriller marked by dark humor and beautifully sinister musical interludes. Post- screening Q&A with Director/writer/actor Sean Hartofilis. Saturday, November 11, 9:45 p.m. The first EDM-powered "silent" narrative film uses a wall-to-wall soundtrack (featuring Dash Berlin, Armin van Buuren, and many more) rather than spoken dialogue to steer a story about two Portland buds on a very trippy road trip to a big Vegas music festival. Post-screening Q&A with director Benjamin Mattingly, actors Amick Vicciello and Johnna, producer Scott Little. Saturday, November 11 at 8 p.m.
Sunday, November 12, 12 p.m.
Made for public television, this effusive documentary gathered three generations of New Orleans piano legends — blues and boogie man Tuts Washington; his protégé, R&B pioneer Professor Longhair; and the great songwriter and producer Allen Toussaint, a Longhair disciple — for an historic keyboard summit. A film as rich in flavor as New Orleans's musical culture itself that will have you grooving and bouncing in your seats. A young artist eking out an aimless existence in San Francisco tries to sort out a battery of conflicting emotions upon returning to her small Wisconsin hometown, a year after her father’s death, for her best friend’s wedding. Weaver, who also wrote, edited, and stars as June, makes an assured feature debut in this sharply observed seriocomic character study; her husband, Wisconsin singer-songwriter Chris Irwin, composed the rootsy score. Post screening Q&A with director/writer/actor Rebecca Weaver, producer/composer Chris Irwin. Writer/director Mays, currently co-starring in Snowfall, and rapper/actor Tristan “Mack” Wilds (of The Wire and Adele’s “Hello” video) are X and Nisha, childhood friends from South Central who turn a game of crooning smooth R&B versions of rock and pop classics into a series of viral tracks. A canny mix of urban drama, romance, bromance, and cautionary tale on the perils of returning to the ’hood. Sunday, November 12, 2 p.m. The New England troubadour credited with launching the singer-songwriter movement and introducing audiences to the work of Joni Mitchell, James Taylor, and Jackson Browne tells the story of his musical life. Tom Rush will take part in a Q&A after the screening and before his Nov. 12 live performance at the Old Town School. Sunday, November 12, 2:15 p.m.
Oxfam America and CIMMfest present a journey deep into the music and dance traditions that have framed life in Mali for generations but are under threat from poverty and war. A panel on Oxfam's work in Mali will follow the film, including a Q&A with Bob Ferguson and Jackie Nelson of Oxfam America. Sunday, November 12, 2:40 p.m.
A people’s history of New Orleans culture wrapped in a making-the-album doc as Basque rocker and filmmaker Muguruza – known in Spain for his radical politics and multiculti musical blending – records in NOLA with local luminaries ranging from Preservation Hall to zydeco great Sunpie Barnes to bounce queen Katey Red. Between sessions, Big Easy artists, writers, and scene mainstays talk about the city’s musical past and post-Katrina present. Post screening Q&A with director William Miller. Sunday, November 12, 4:30 p.m. Screening for free at Comfort Station, this BBC music doc goes behind the scenes at the making of Bowie's The Next Day and Blackstar albums, offering an intimate look at the final phase of one of the defining creative lives of our time. Sunday, November 12, 4:45 p.m.
Let’s all go to the bar! Deer Tick’s 10th-anniversary gig on New Year’s Eve 2015 provides the spine for this time-shifting, beer-soaked chronicle of the indie rockers’ evolution into one of America's premier cult bands. Q&A to follow with filmmaker William Miller. Sunday, November 12, 5 p.m.
Papa Grows Funk was the quintessential Crescent City groove band, a supergroup of local players who drew fans from around the world for their renowned Monday-night residency at the Maple Leaf Bar. Percolating with electric performances, this doc wraps the tale of the band and its breakup into a larger story about New Orleans music, crystallizing the tension between the ease of being a working musician in a city that supports homegrown talent like no other and the frustration that can come with wanting more than that. Sunday, November 12, 7 p.m.
Mexican guitarist Camilo Nu goes adventuring in search of his musical roots, crossing the Atlantic to find the Andalusian, Arab, and African antecedents of son jarocho, the traditional folk style of his native Veracruz. Followed by a performance by Camilo Nu. Opened in 1979 as Chicago's first alternative dance club, Neo reigned for 36 years as a sanctuary for misfits, weirdos, and outcasts and ground zero for an explosion of fashion and music trends. Richter's labor-of-love documentary debut is a true testimonial of a club that not only outlasted its competitors but never lost its attitude, or its reputation as a place where people celebrated their individuality and danced their asses off. Q&A with Director Eric Richter, Neo DJs Suzanne Shelton, Jeff Moyer, and Scary Lady Sarah, Metro/Gman Tavern owner Joe Shanahan. Presented with CHIRP Radio. Sunday, November 12, 7:30 p.m. Individual advance tickets range between $6-$12 for festival screenings and events. Stay tuned for more information on cimmfest.org and by liking us on Facebook and following us on Twitter and Instagram. The Chicago International Movies and Music Festival (CIMMfest) is a 501(c)(3) nonprofit arts organization dedicated to bringing together filmmakers, musicians, artists, industry leaders and audiences from diverse cultures around the world. 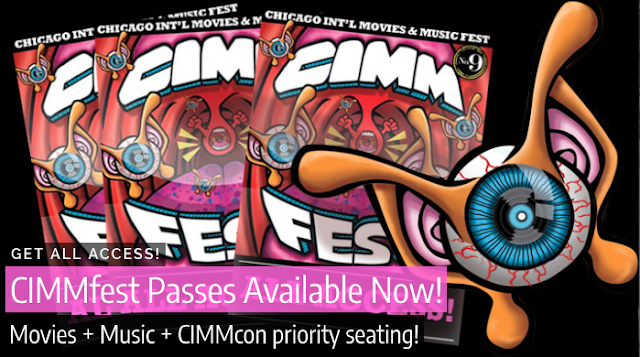 In addition to producing year-round film screenings, concerts, and professional development programming, the organization produces one of Chicago’s most highly anticipated and largest cultural events of the year: CIMMfest. The four-day, 100-plus multimedia event features film premieres, live concerts and a dynamic professional and entrepreneurial industry conference. CIMMfest serves a growing, diverse community of artists, industry and fans, in order to reveal the transformative power of music to foster creativity and communication,educate, enlighten, and entertain.